Leem's Animation Tools 2 is a small collection of After Effects tools brought together into a single user friendly pack. These tools were designed by animator Liam Hill as work-flow enhancements for character animation. Initially developed as stand-alone scripts for specific needs, the tools have evolved over time and practice into a refined, UI-driven pack allowing customisation and flexibility. Version 2 has been redesigned from the ground up, and vastly improves upon version 1 both in terms of performance and ease of use. The biggest change in functionality is the introduction of the Sprite Swapper Library, which is a UI-based control panel for Sprite Swappers. The library is dynamic, and therefore builds and re-builds itself to reflect changes made to the project such as naming and content. The user can then simply open the library and manipulate all sprite swappers in the project from one place by clicking on the sprites they want to show. This system makes it incredibly easy to control swapping no matter how complicated your project is. Simple one-click use for quick results, or dive deeper and tweak settings to suit your specific needs. Easily create controls throughout your project that flip between layers or frames of compositions, and manipulate them all from a single, dynamic UI-based library. Create Null controllers for puppet pins and parent them together or to other layers, giving mesh deformation all the advantages of a hierarchal animation system. Easily create the illusion of animation strobing when and where you want it, eliminating the 'tweeny' look of digital animation while retaining the original curves. Create point constraints and direction constraints for any object despite it's ancestry, to make working with rotations simple and fast. Instantly bake any section of any animation curve into a series of hold keys at a specified interval, to allow for quick blocking and timing work. Take some of the headaches out of animation with Leem's Animation Tools! 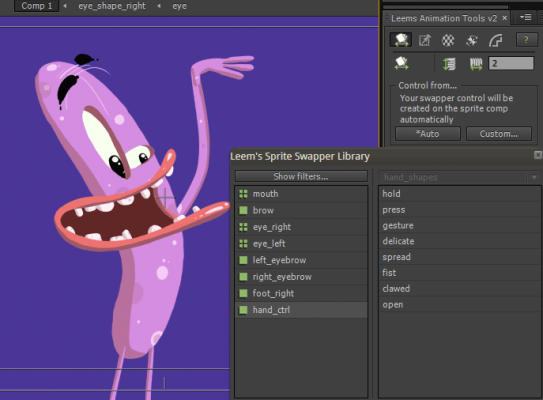 Upgrade Notice: If you bought Leem's Animation Tools after Aug 9, 2014, you upgrade for free. If you purchased it before you can upgrade with a 25% discount. If you have any questions please contact support.